Ventured into your attic and crawl? Taken aback by its condition? Act quickly else the damage and destruction will rob you off everything you have – property, health, belongings and money. 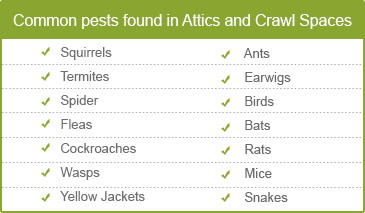 The dark and dreary interiors of the attic and crawl space attract pests, bugs and other infestations. Not taking out time to clean and upkeep these confined regions on regular basis allows these infestations to breed and multiply and wreck havoc in the entire unit. Regular inspection and periodic evaluation of these spaces thus helps cut damage big time. Seeking expert advice also proves prudent because professionals are better equipped than amateurs to pick up crucial clues. We, at Quartz Solutions, are a team of skilled technicians who can take up monitoring, cleaning and improvement tasks in the rightful manner. Numerous dangers lurk in unattended and ignored attic and crawl spaces. Tackling these problems early on can protect you from extensive damage and save thousands of dollars in expensive repairs. Rodents, bats, squirrels and birds nibble upon wires and vents disturbing the insulation system and inflating energy bills manifold. Their waste and remains make the area infections and smelly. Crawling insects like roaches, beetles, spiders and wasps carry germs that trigger infections and diseases in humans. Damaged ducts allow water and moisture to seep in allowing mold, mildew and fungus to thrive and spread serious diseases. Termites and carpenter ants eat into the wooden structures and panels. Cracked air vents let harmful gases leak into the crawl and living spaces triggering breathing disorders and cancer. A meticulous inspection of the attic and crawl space is essential to enjoy a healthy, hygienic and comfortable property. Hiring experts makes the job easier and more effective. We, at Quartz Solutions, are the undisputed leaders in the business. With our professional approach and extensive knowledge we will assess your property to identify defects and damages. The best plan within your stated budget will be put forth to restore the situation. Our motto is to provide customized and high-quality services at cost-effective rates with no hidden charges. At Quartz Solutions, we strive to achieve it in every possible way. Named after its location along the Hackensack River, River Vale is a small borough in Bergen County, NJ. Home to less than 10,000 people, the place has wonderful homes and mansions, buzzing market places and parks and resorts. Let us be a part of your wonderful community and contribute towards its cleanliness quotient. 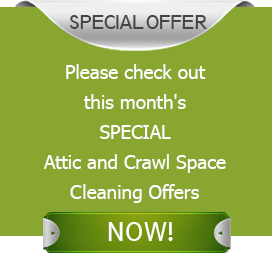 Hire us to help you keep your attic and crawl spaces clean and functional in every way. Call us at 201-205-2042 and schedule your free inspection and consultation, today! My attic insulation was worn out, so I sought professional help and insulated the attic ceiling and walls. Good knowledgeable people, affordable prices. I m happy to recommend them to family and friends.